No 9 St Francis Street. According to Colm O’Donnellan of O Donnellan & Joyce purchasers who are looking to buy quality property investments will be interested in these two gilt edged commercial and residential properties, which have been just brought to the market by O Donnellan & Joyce. The first of these is No 9 St Francis Street, Galway, a modern building which was totally refurbished and constructed to the highest standards in 2000. The building has two quality tenants. The first tenant is the Legal Aid Board, which occupies the first floor (2,217sq ft ), second floor (840sq ft ), and the third floor (586sq ft ). The Legal Aid Board has a 20 year lease from April 1 2000, and the lease contains no break clause. The second tenant is the National Association for the Deaf, which occupies the ground floor comprising 1,610sq ft, and its lease term is nine years and 11 months from September 30 2012. 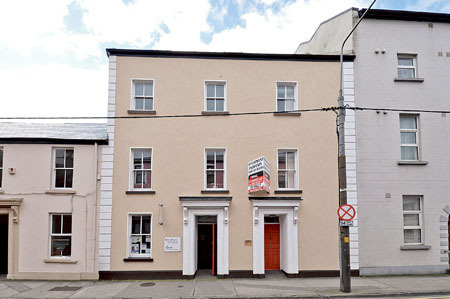 The property enjoys a high profile location on St Francis Street which connects Eglinton Street to Courthouse Square and is one of the main routes to NUIG and Galway Courthouse via Galway city centre. The area surrounding the building is mainly office premises, and includes the offices of a number of well known Galway solicitors due to its close proximity to Galway Courthouse. Shop Street, Galway’s main retail area, is 50 metres from the property. The property is an exceptional building with two quality tenants with a strong rental income. The asking price is €900,000. The BER rating is D2 and E2. The second property for sale is No 8 Fr Griffin Road, Galway, situated across the road from Galway Technical Institute on the main thoroughfare between Salthill and the city centre. Located in a prominent position, the property has a large forecourt which offers parking to front. Part of the ground floor and part of the first floor is currently leased to the Crescent Pharmacy — the tenant is not affected by the proposed sale — and the remainder of the building comprises self-contained residential accommodation. No 8 Fr Griffin Road is in exceptionally good condition throughout and has been maintained to a high standard with little or no work required. The asking price is €320,000. According to O’Donnellan & Joyce both these properties are gilt edged quality commercial and residential investments and better than money in the bank. The agent said that anyone purchasing either of these properties and holding it for a period of seven years will have no capital gains tax in the disposal. This is a tremendous opportunity to acquire two quality investments located in Galway city. For further particulars contact Colm O’Donnellan of O’Donnellan & Joyce auctioneers Ltd on 091 564212.